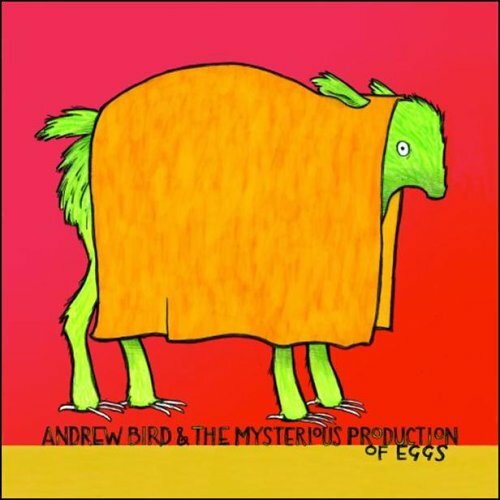 Already, there have been some great albums this year (The Books’ coming release for a start), and Andrew Bird’s ‘The Mysterious Production of Eggs’ is yet another you have to buy. Why? Because it’s poppy and arty, catchy and challenging. It doesn’t follow fashion, it sets it. His 2003 album, Weather Systems was also of its own time, in its own little space. In the above track, you can hear all the elements that I love about Andrew Bird’s music: the violin, his voice, his lyrics, the unusual arrangements framed by his own production style. It’s all there. There isn’t a dud track on ‘Eggs.’ They’re all different, there’s even a storming rocker in ‘Fake Palindromes’ with a supercatchy violin hook. I think my fave so far is ‘Skin Is, My’ which is simply a brilliant, soaring pop song. It’s propelled by Bird’s signature jaunty pizzicato and the feel of the song is wonderful, veering from almost Latin-jazz to rock in the space of a few bars. It’s so good to hear this kind of song, it’s so defiantly out-of-step with all the current trendiness. But I expect if Bird felt like whipping out a Gang Of Four pastiche or winsome electronica, he’d probably do that brilliantly as well. The git. Buy this album. I’m not going to say where but you can get the CD for £9.99 online. A tenner for such excellence, well worth it! Go! Team – Free iTunes Download!